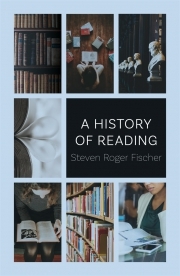 Steven Roger Fischer’s fascinating book, now available in an updated B-format edition, traces the complete story of reading from the time when symbol first became sign through to the electronic texts of the present day. Describing ancient forms of reading, Fischer turns to Asia and the Americas and discusses the forms and developments of completely divergent writing systems and scripts. With the Middle Ages in Europe and the Middle East, innovative re-inventions of reading emerged – silent and liturgical reading; the custom of lectors; reading’s focus in general education – whereupon printing transformed society’s entire attitude to reading. Fischer charts the explosion of the book trade in this era, its increased audience and radically changed subject-matter; describes the emergence of broadsheets, newspapers and public readings; and traces the effect of new font designs on general legibility. Fischer discusses society’s dedication to public literacy in the sweeping educational reforms of the eighteenth and nineteenth centuries, and notes the appearance of free libraries, gender differences in reading matter, public advertising and the ‘forbidden’ lists of Church, State and the unemancipated. Finally, he assesses the future, in which it is likely that read communication will soon exceed oral communication through the use of the personal computer and the internet, and looks at ‘visual language’ and modern theories of how reading is processed in the human brain. Asking how the New Reader can reshape reading’s future, he suggests a radical new definition of what reading could be. Steven Roger Fischer FRS is former Director of the Institute of Polynesian Languages and Literatures, Auckland, New Zealand. He has written many books including A History of Language (1999), A History of Writing (2001) and Island at the End of the World: The Turbulent History of Easter Island (2005).